The jetty was built to service the nearby lighthouse. Until 1998 it was stocked and serviced from the 'Pole Star' supply ship. The seven green tanks at the jetty held thirteen thousand gallons of diesel each. Collectively they were able to supply the energy requirements of the lighthouse for one year. 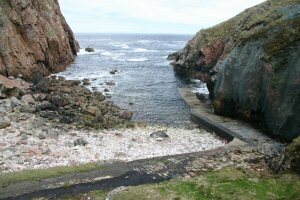 The tanks have now been removed and the jetty is used nowadays as a landing point for military exercises, with SAS soldiers being set ashore here. They then have to fend for themselves for up to two weeks in this remote and inhospitable area.